A.S. elections just finished a few weeks ago and the current A.S. Council is working hard on a smooth transition. Throughout the election season, candidates made plenty of campaign promises — promises they will have to keep next year. One of the candidates, Dennis Yeh, claimed “student needs promised by all slates for years are not getting accomplished.” Voter apathy slowly creeps up as many feel that while their vote counts, no results seem to materialize. I interviewed UC San Diego’s A.S. president and vice president of campus affairs to discuss the campaign promises they made last year and how well they had fulfilled them. I met with UCSD A.S. President Daniel Juarez, a fifth year in Muir College, in her office on the fourth floor of Price Center. Entering a stuffy room with no windows, I sat on a cluttered couch, feeling claustrophobic. I noticed Juarez was on her computer reading the recently released report on the UC Office of the President audit and she was still a little sick, but she took a break to talk to me. When Juarez ran for president last year on the Students Determined slate, one huge component of her campaign was improving basic needs and services on campus. Food was the most obvious of these basic needs. Passionately, she told me about the Triton Food Pantry, which had just finished reconstruction in February, and how she was taking the next logical expansion by acquiring funding for the creation of a basic needs resource center. The plan is for the new basic needs resource center to take over some of the programs Triton Food Pantry provided that were unrelated to directly providing food — for example, cooking demonstrations. Triton Food Pantry also implemented care packages as a service; Juarez explained that while it was not on a large scale, they were able to provide items such as deodorant, toilet paper, toothbrushes, hygiene and menstrual products. She has also hired a basic needs coordinator. “[They are] on campus and already sign up students for CalFresh,” Juarez told me, referencing the food benefits program. 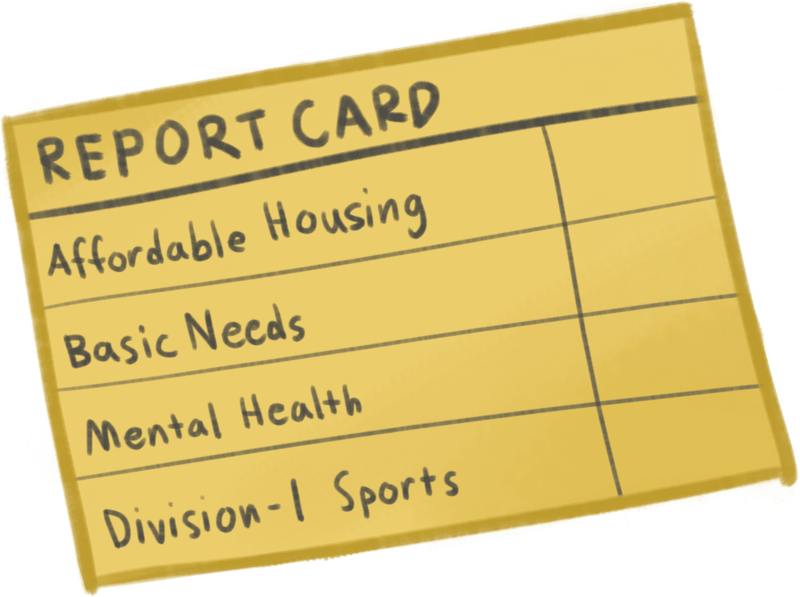 Despite working with the financial aid office and other entities on campus, Juarez dropped this specific implementation of creating affordable off-campus housing for one simple reason. However, it’s not all failure when it comes to fixing housing insecurity. Since her affordable housing plan didn’t pan out, Juarez pivoted to focus on temporary and emergency housing. When I asked what that was, she explained what it meant to be house insecure. Working with the deans of student affairs (“especially Patty,” Juarez noted, referencing Muir College’s dean of student affairs Patricia Mahaffey), Juarez pushed for the creation of programs to provide temporary housing for those who are house insecure by utilizing extra rooms on campus. Though the system is not formalized, Juarez is far more satisfied with the work she had done on temporary housing than affordable housing. The next week, I had a chat with Sabrina Ekdahl at Price Center Starbucks. It’s a sunny day, and we sit outside in the fresh air as students bustle around on their way to class. UCSD’s A.S. vice president of campus affairs is a senior in Eleanor Roosevelt College. What exactly does she do? I asked her if she remembered the campaign promises she and her slate, Tritons United, ran on the previous year. She laughed hesitantly and I raised my eyebrow for her to continue. For her campaign, Ekdahl ran on themes that occasionally overlapped with Juarez’s. One of these intersecting pledges was improving mental health services for students by working with Counseling and Psychological Services. Referencing the Tritons Flourish program within CAPS, Ekdahl described the current state of improving mental health services as “very initial, still collecting data.” Both Juarez and Ekdahl said while hiring for CAPS had accelerated (Juarez explains that after hiring a few new counselors this year, CAPS is only five counselors short of the optimal ratio of “one counselor per thousand students”), large steps for campus mental health could only be part of their long-term visions. I pried for specific policies or projects on the mental health efforts from Ekdahl, but didn’t get any. A huge proponent of Division-I sports, Ekdahl was very excited when the Division-I referendum passed last year. Part of her campaign promises was a call for more school spirit and a strong push towards Division-I sports. Here, she was more successful; Ekdahl worked with the Athletics Department to create a spirit summit that brought together leadership from various spirit groups at UCSD. However, UCSD was denied membership to the Big West Conference on April 6. She explained that students from the leadership committee are working with the vice chancellor of external affairs, who will work with those at other universities to rally support for UCSD to get a bid by 2018, the deadline for the university to enter Division-I before the student vote becomes void. However, she clarified that lighting in other areas on campus have been improving. Ekdahl has gone on lighting walks with a group at the Sexual Assault Resource Center to mark dark areas. “They recently updated the lights in Warren Field over here, so if you walk around at night, these are white lights,” she said, pointing in that direction. Other areas on campus still currently utilize dimmer, yellow lights. The goal is to update the lights all around campus so that darker areas are more brightly lit. Furthermore, new Sixth College will incorporate these new lights. Both Juarez and Ekdahl spent time telling me the A.S. Council standing rules were finally being modified, and both seemed legitimately excited about this fact. The A.S. standing rules detail how A.S. Council operates but is a long and over-complicated document; Juarez explained that every year, people want them to be changed but the result is always half-baked. This year, they’re working on changing the rules legitimately. Ekdahl has the same issues with the standing rules. “[The standing rules] needed be to cleared out and changed before any work can productively be done.” In fact, Ekdahl felt like there were no records or documentation about her VP of campus affairs position, making her job difficult to do. As we wrapped up, Ekdahl gave me a bit of insight into the difficulty of keeping campaign promises and a quick flashback to her campaign the previous year. It’s true that issues on campus don’t fix themselves automatically. Neither of these jobs are particularly easy, and even when promises are followed through, many students at UCSD either don’t realize or don’t care. But students have also come to expect stagnation, and this expectation is reflected in low voter turnout for A.S. elections. Perhaps in the years to come, progress will face fewer roadblocks as the standing rules are revised.